The Madrid municipal government has vowed to appeal a court ruling this week that Spain’s 2007 Historical Memory law does not require a change in the name of a street honouring soldiers of Spain’s so-called División Azul who died in World War II fighting alongside Hitler’s troops on the Russian front. 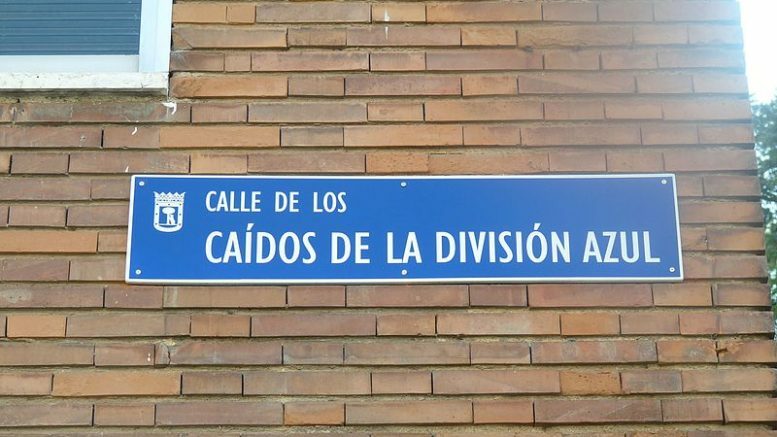 The administration of Madrid Mayor Manuela Carmena had argued that the street name “Caídos de la División Azul” (the Fallen of the Blue Division) should be changed along with 51 other names of streets and public squares that a special commission has said violates the 2007 law. Passed during the government of Socialist President José Luis Rodríguez Zapatero, that law calls for the removal of insignias, plaques and other public commemoration glorifying the 1936 uprising by military forces against the democratically elected Spanish Republican government, the triumph of those forces in the Spanish Civil War or repression during the subsequent 35-year regime led by dictator Francisco Franco. A judge hearing a complaint filed by the Partido Popular (PP) in Madrid has now ruled that the División Azul street does not fall within the jurisdiction of the Historical Memory law because the name does not commemorate the triumph of Franco-led forces in the Civil War, nor were those soldiers who were sent by Franco in 1941 to fight alongside Hitler’s troops directly related to the military repression of Franco’s political opponents in Spain in the war’s aftermath. Many of the División Azul troops and officers had fought in the Spanish Civil War against Republican forces and subsequently volunteered to serve in the Spanish division as part of the Axis forces fighting on the German army’s Russian front. The Carmena government has said it believes that the División Azul was created by Franco specifically to return to Hitler the favor of his having supplied military support to Franco’s forces during the Spanish Civil War and noted that the Spanish division was directly integrated into Hitler’s army. In vowing to appeal the judge’s ruling, the Madrid government said the street name remains “incompatible with the democratic and civic values that must be reflected in the street map of Madrid in the 21st century”.